Android or Windows? Android or Windows? 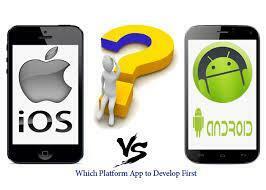 Apple or Android? How many times have you found yourself in this confusion? 1, 2 ,3 or more than that. Yes, definitely; every time you think of getting your business app developed; this thing stops you from doing so. So, when will you get the answer to this question? When will you be able to get an app developed for your business? Thinking won’t help you to get it done. You need to do or you need to hire an expert who can do so. I think this time you sincerely prayed to God 😉 to have the answer for this question and so you are redirected here to get the answer. Yes, you got it right. This blog post covers those things that can help you to decide which platform to choose. How to choose an App development Platform? The moment you think of getting an app developed, this is the question that constantly keeps you worried. Well, to end this worry; let me tell you that before you opt for any platform; know several things like as app type, competition prevailing in the market, app development complexity, available resources and technology etc affect your decision related to platform selection. At present, there are four main operating systems available in the market viz. Google’s Android, Apple’s iOS, RIM’s Blackberry and Microsoft’s Windows Phone. The mobile app development is surrounded within these four. Among these two, the major players that rule the app development world are Android and Apple iOS where the former has 84.71% of market share and the later has 13.1%. Even though Android’s market share is huge, Android developers are less wealthy as compared to iOs ones. Basically, the first factor that affects your platform development decision is the “App Type”. This means if your app is meant for high class people then iOS is recommended; if it is for youngsters, teenagers, middle class people then Android is recommended. Business based people mostly use iPhone and nearly 62% smart phone users have iPhone whereas 47% of business people use Android based phones to fulfill their business needs. However, if you are planning to develop a free game and need innumerable downloads then go for Android. If you are going to make a paid app then opt for iOS; the reason is iOS apps are somewhat expensive then Android ones and the one who uses iPhone might be possessing credit card as well and hence they can easily pay for the apps. Another thing is the “Type of Customization”; so if you want heavy customization in your applications then Android is useful for you as iOS seems to have lots of complexities when it comes to customization. Last but not the least; your target market- To reach n number of people all at once; go for Android and if your app is only for executive people then go for blackberry; for quick and wide exposure; Windows is preferred the most but if you want to be famous around the universe then go for iOS. Hope you will get the right direction after reading this blog post regarding selection of mobile app development platform. Let us know how we helped you and to what extent we reduced your worries. Finally, if you have decided as to which platform to choose and now if you wish to get your mobile app developed from experts then get in touch with Platinum SEO; an esteemed Mobile app development firm in Melbourne.